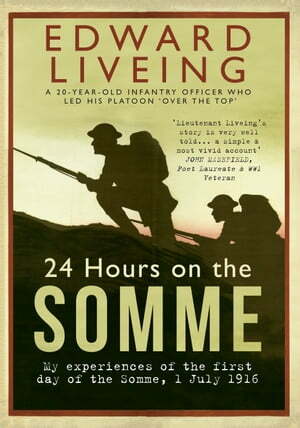 Collins Booksellers - 24 Hours on the Somme by Edward Liveing, 9781445655468. Buy this book online. A rare and forgotten first-hand account of the first day of the Battle of the Somme by a British infantry soldier who went ‘over the top’ and survived. There are many accounts of the Battle of the Somme by surviving British soldiers. However, the Somme was not a single battle, but a series of offensives and small localised attacks fought over four and a half months. What is etched into the British psyche is the huge loss of life suffered by the ‘poor bloody infantry’ on the first day of the Somme, 1 July 1916. The carnage was such that few survived to tell the tale of that first horrific day, and the existing published memoirs are either about later in the battle or were written by non-infantry troops who, while involved in the offensive, didn’t actually go ‘over the top’. What is unique about Edward Liveing’s vivid and detailed account is that it is entirely focused on the first day of the Somme, beginning the evening before the attack and ending close to twenty-four hours later. A young junior officer in the London Regiment on the battlefield that infamous day, he was in command of a platoon of about fifty men when he scaled the crest of his trench into no-man’s land. Edward Liveing’s account is known and has been quoted from, but unbelievably this is the first time since its publication in the USA in 1918 that it has been republished in its full, horrific, unexpunged glory. Newly illustrated and endorsed by Lieutenant Liveing’s family, 24 Hours on the Somme is the ideal book to commemorate the sacrifice made a century ago.